Had the urge to get out my pre- SU scrapping supplies on the weekend and just scrap without a stamp in sight. I have had these two pictures of my son sitting around for ages waiting to be to be scrapped. This one is Crate Paper with some Hambly Rub Ons and some bling. I have also used a ghost butterfly and outlined the edges in kindyglitz, but not sure how easy that is to see (Sam is looking up at it). How beautiful is the Wisteria! This one is a quick and simple one. It's a bad scan as it's straight irl, but the monogram is very bulky and that always sends my scanner into a tailspin! I embossed some cardstock with my Cuttlebug and then covered the monogram with it. I didn't actually take this photo. When Sam was five months I went to scrap with some friends and the minute I walked in the door they grabbed Sam and used him as a little model. I got lots of lovely photos by Jodii and Rach that day and this is one of them. Thanks guys! How cute are those angel wings! The weather has been beautiful here in Melbourne. On Saturday we packed a quick picnic and went to the lake. It was so relaxing. I love it down there. Lots of good photos to scrap. Yesterday I ran a crop at P2P in Lilydale. It was a fun day and I really enjoyed chatting to the regulars and helping them confront their fears of trying new ways of doing things. Having said that, I decided last week that I wont be running any more classes and crops. I enjoy it, but the problem is I have such limited leisure time between family life and working, that I have decided I want to use that time strictly for my own leisure and pleasure. 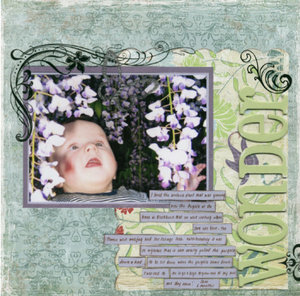 I want to do my own stamping and scrapbooking in that time and maybe actually take some classes and do some retreats just for myself. I will still be doing Stampin' Up! and Paperific but perhaps limiting the number of parties I do each month. This great hobby has a way of getting a bit complicated if you let it, and I have to keep reminding myself the reason I do this - for my own relaxation and for memories for my family. I feel good since I made that decision. OK, off to play with my little man :) It's a lovely day and I intend to make it a fun one as well. Hope you do as well. Beautiful day here in Melbourne. Sam seems much improved today as well, the most noticeable improvement since last week, so that's good. Still not 100% but definitely on the mend. Been playing with my vintage things again this weekend. I had a clean out Friday night (more on that later) and I found this gorgeous sheet of Fancy Pants 'Aged Florals' paper and just had to make a card with it. A little lace, a little metal and some Cuttlebug embossing and we are done. The stamp is my Stampin' Up! friendship flowers stamp again. You will be seeing LOTS of that! I have also used the daisy from Stampin' Up! Petal Prints set in the top left. If you would like to see the Cuttlebug in action and have a play with my 9 different embossing folders to make some cards (I'll show you how to ink them to bring out the embossing as well) - book into 6 hour crop at Picture to Page in Lilydale next weekend. It goes from 10am to 4pm and I will be there all day to help you plan and complete your pages and make cards. I will also be demonstrating the Cuttlebug and some colouring techniques to use on your scrapbooking pages. Call the shop on 9739 7299 to book your spot. 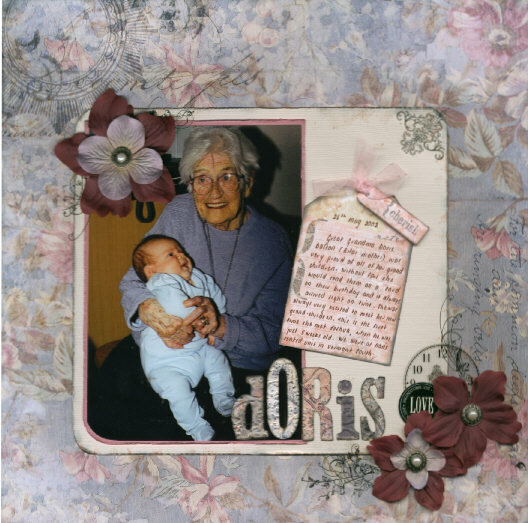 I also completed this heritage layout of my husbands Grandmother with my eldest son when he was just 5 weeks old. These sort of photos are so precious to me and one of the main reasons I scrapbook. To preserve them and record the memories that go with the photo. 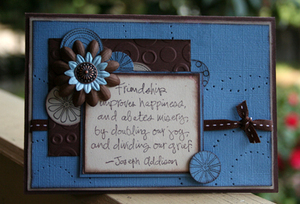 The papers and die cut letters are daisy D's which I picked up at Picture to Page yesterday. I have used other bits and pieces I had in my stash - a Daisy D's tag, Heidi Swapp ghost clock, Basic Grey and Delish rub-ons, 7 Gypsies sticker and the yummy brads are by Delish. I embossed the die cut letters in my Cuttlebug as well (you have to be tied down not to embossed in my house!) and then inked them with Stampin' Up! Buckaroo Blue ink which was a great match for the paper. I have wayyyyy too much stuff. Really nice stuff like patterned paper and lace and ribbon which would be great for cards and layering in scrapbook pages. I'd like it to go to a good home, so I have 5 A5 padded envelopes of goodies to give away (international readers can also enter!). To enter, just subscribe to my blog via Feedblitz (top right hand column) between now and midday next Sunday (Melbourne time). I will then get DS5 to draw 5 winners. Please note - if you have subscribed to my newsletter through Constant Contact over the last couple of months, please subscribe here again as this will be my main way of communicating with my readers from now on :). You'd hate to miss a special or a giveaway now wouldn't you? It's been 'that' type of week. DS 2.5 very unwell since Sunday and took a couple of visits to the doctor to finally get a diagnosis of Tonsilitis. So consequently I haven't had a chance to do much this week, but while I sat up late last night I made some cards. Much different from my usual style (the last two are anyway!) but I needed to make some different cards for my Stampin' Up! workshop displays. I don't have much in the way of bright or kids cards. This one started out as a colour challenge, then I realised I didn't have one of the Stampin' Up! colours so I had to improvise with some bazzil.Lots of circles going on here. I like this colour combination. The quote is from one of my new Stampin' Up! sets, Friendship Flowers. Thanks to my many great customers I reached a major sales and recruiting goal at the end of July, so I got to choose 12 new stamp sets from the catalogue for free - Stampin' Up! company is very generous to it's demonstrators and hostesses. I also used Polka Dots and Petals and my Cuttlebug with the Dots and Spots embossing folder. 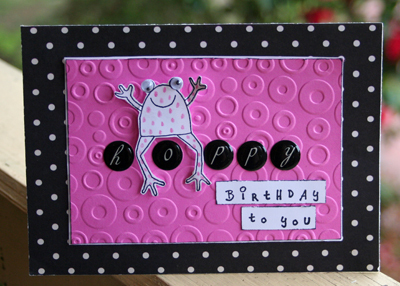 This one used one of the cute little frogs from Stampin' Up! Unfroggetable that Christine, one of the lovely ladies in my team let me stamp last weekend at our catchup. I also got the ideas for the eyes from her. He's looking a tad infectious with all those spots isn't he! 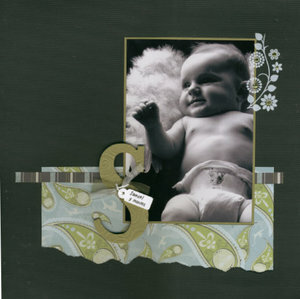 Finally a girly one using Stampin' Up! 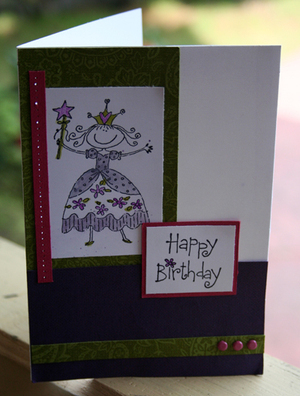 Pretty as a Princess and some watercolouring with some bright colours Rose Red, Elegant Eggplant and Old Olive. Bit hard to see this one well as the light wasn't too good for the photo. Hope you are having a good week. I have a quiet weekend planned, so hopefully I will get some quality family time with a little creating time thrown in. This set has generated much discussion among my workshop guests lately - we all agree that snowflakes aren't exactly synonymous with an Australian Christmas, but we all love the set anyway and want it! Last night some of the girls in my Stampin' Up! team came over for a night of stamping. Over a yummy cheese platter we swapped stamps, leaned tips from each other and had lots of fun. 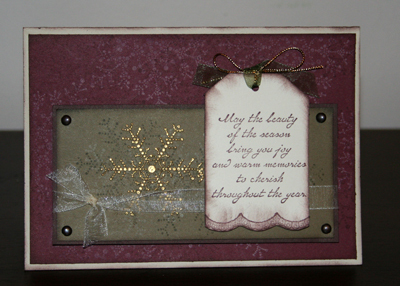 I borrowed Viv's Snowflake Spot set and made this card. The Bravo Burgundy layer has been stamped with Bravo Burgundy and Very Vanilla and the True Thyme layer has been stamped with Always Artichoke and Very Vanilla. Then I embossed a snowflake in gold. 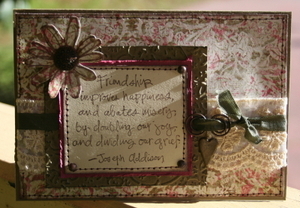 The sentiment on the tag is from Stampin' Up! Solemn Stillness and I also used Trimtastic on the bottom of the tag. Thanks for the emails and comments asking about my last card. The scalloped squares were made using the set of 2" Cuttlebug dies. I cut them first and then embossed them with the cuttlebug. Check out this months classes here and current specials here. Made this one for a colour challenge on the Elite Challenges Blog. The Stampin' Up! colours we had to use were Sahara Sand, Cool Carribean (doesn't that just make you want to go on an island holiday ...), Old Olive and my favourite Choc Chip. I already had these long note cards from the current Spring Mini Catalogue. I am loving these, quick and easy just to grab and start, great quality cardstock to stamp on and nice colours. I wanted a subtle background pattern so I used the Polka Dots and Petals set with Versamark Ink. I then cut and embossed the scalloped squares using my Cuttlebug. The image is from Figures of Speech (this was a great purchase as it's so versatile - I have used it so much) and I watercoloured the love bug with the Cool Carribean ink pad. The happiness word is from my Warm Words set. Another great value set - you get eight words in the set! 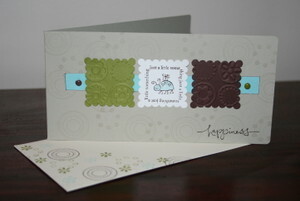 I like these colours - it gives a nice fresh happy feel to the card.